Norton Lindsey 1sts wrapped up their Cotswold Hills Premier Division campaign with a six-wicket win at Leek Wootton, while their 2nds thrashed Wellesbourne 2nds by 132 runs to clinch the Division Two title. After losing the toss at the Memorial Ground, Norton skipper Richard Pozzi and David McInnes demonstrated why they are considered one of the best attacks in the top flight. Norton Lindsey bowler Richard Pozzi appeals in vain for the wicket of Zesh Khan. Their relentless pressure meant Wootton took five overs to get off the mark and by the 16th they had struggled to 25 with three wickets down, two of them stumpings by Gavin Shephard. Pozzi conceded seven off his seven-over spell, while McInnes bowled straight through, finishing with three for 24. Zesh Kahn (25) held the home side’s innings together and went after change bowler Richard Blythe to try and improve the rate, with 17 coming off one over. The flurry was short-lived as keeper Shephard claimed his third stumping, allowing Blythe and Sunny Nijjar to regain control of the rate once again. However, from 54 from four, Stuart Budd (36) and Martin McKenna (53) put together a solid partnership of 43. McKenna then stuck around long enough to hit some lusty blows as the innings drew to a close, lifting the total to 157. Norton slipped to 16 for three in reply before Conor Green and Stuart Shephard saw off the new ball and then clicked into gear, scoring 90 in 12 overs. The partnership had progressed to 140 when Green, who had suffered a dislocated finger in the warm-up, was bowled for 60. The line was crossed in just the 25th over, with Shephard’s unbeaten 74 a real masterclass in shot selection, containing 13 boundaries. 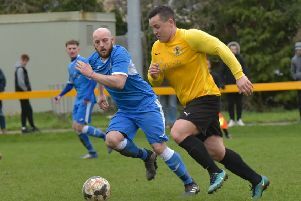 Already promoted from Division Two, Norton’s second team wrapped up the title with a convincing win at Bourne. Skipper Dan Fell elected to bat first and he and opening partner Martin Perfect put on 87 until Perfect (32) was bowled in the 18th over. A small wobble saw three more wickets fall, including Fell for 47, to leave Norton on 100 for four and their innings requiring a jump-start. That came in the form of Andrew Dellow (34) who found the boundary seven times during his short stay. Continuing the momentum generated by Dellow, Andrew Cooke (42) and Ian Baber (35) kept up a brisk scoring rate as Norton closed on 227 for seven. Rory Baker and Andrew Dellow took the new ball and produced some excellent pace bowling. Dellow was the first to taste success, rattling the stumps of James Wilson (6), while Kite took a smart catch at mid-wicket off Baker. At the end of their opening spells, Wellesbourne were on 62 for four as Norton turned to their change bowlers to finish the game. Matthew Boyle (25) was the only batsman to have a profitable stay at the crease but he then became the first of Varun Goel’s two victims. Steve Dellow took over at the other end, removing Noah Rose (4) with his fourth ball to maintain the procession of batsmen back to the pavilion. Wellesbourne skipper Phil Rothwell (5) held out for six overs, but after he was bowled by Goel, Steve Dellow finished off the innings on 95 to bring up 33 wickets for the season and secure the divisional bowling award.